Geography was one of my favourite subjects at school and I wasn't too shabby at it either in the early years. I guess being well-travelled at a young age has its perks! Anyway, because of that I always enjoyed games with demographics and being able to make an impact on the world at large. 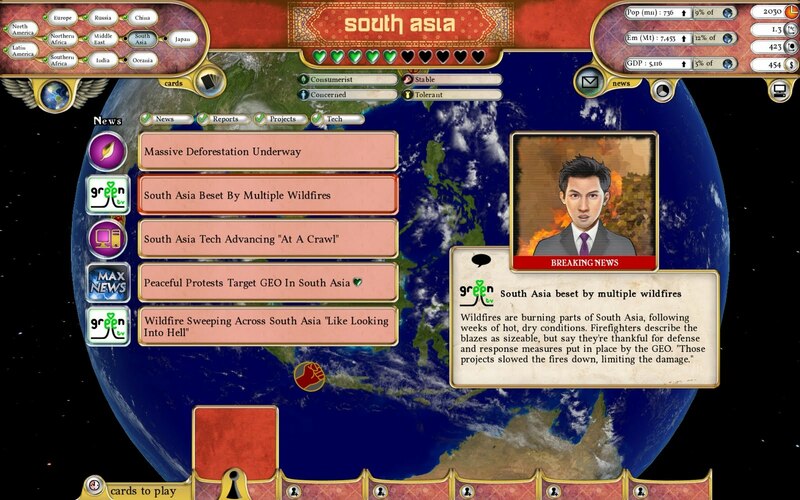 Fate of the World is one of those games and when it went on sale at Steam for USD$5, seemed worth the punt at the time. 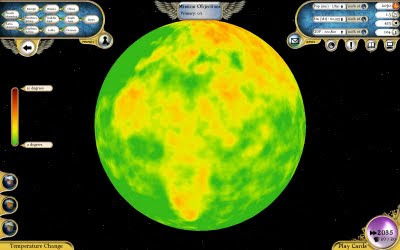 The game's premise is that you basically have to combat climate change, whilst dealing with Earth's dwindling resources and an ever-increasing population. Over the next century or two, will you be able to ensure the human race survives? Sound is pretty basic in this game. Just some generic clicking sounds, cheers, beeps and squeaks. There's basically only one tune in this game but they've gone about it in a very smart way, for an indie game. Basically each region you visit in the game will have a different variation to the main theme, so if you visit Africa you'll hear a lot of drums, visit the Middle East and the Aoud would play, or visit North America, and you get a banjo (sorry to the Canadians out there). I guess the only criticism is that there is really only one tune which might get a bit repetitive for some. I kind of like it though. The fact it's composed by Richard Jacques (who helped composed some of the music in Mass Effect) doesn't hurt either. The graphics are passable in this game. Most of the icons are bright and easy to distinguish. Card artwork consists of blurred photographs (in an artistic style of course) and you get simply animated cartoons playing for each news item. Most impressive is probably the globe itself where you can see the city lights every time night falls upon one half of the Earth. The ocean boundaries actually change over time too depending on the state of the world's climate and there's even a view that shows the temperature around the globe. Fate of the World is set in the near future where due to a string of several disasters (natural and financial) the world forms a global organisation to tackle climate change called the Global Environmental Organisation (GEO). What is choice about this is the organisation (and the organisation's background) has some strong parallels with X-COM (the Agency charged to combat extra-terrestrials in UFO: Enemy Unknown). 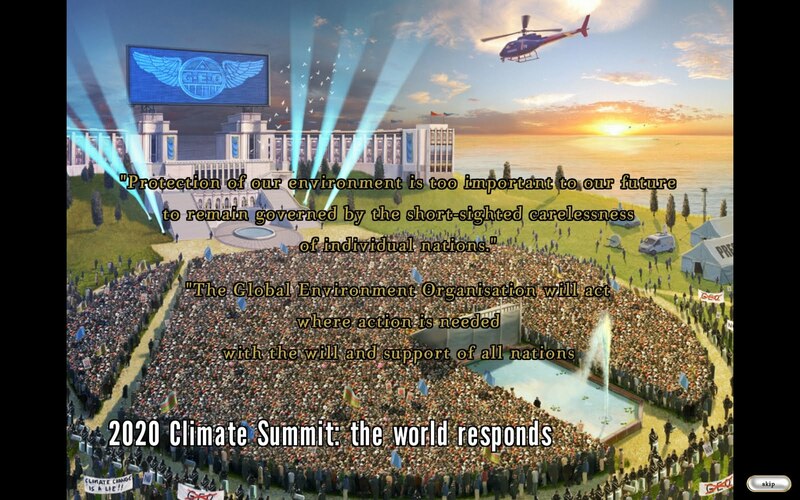 Both organisations were formed after catastrophes struck, both are funded by several countries of the world and both are judged on their performance. The realistic news stories based on actual global events or potential disasters makes the game more believable, although I suppose its entire premise, a new world order, could seem a bit far fetched... but who knows what the world will be like in 2020? You could mistake this game for a board game, since it seems like that at a glance; you get little pieces to place on different regions representing your GEO agents and you get to play cards in order to complete actions each turn (each turn spans the period of 5 years). However, under the hood it's a lot more complex than that. Your actions each turn will determine how several factors will change, such as life expectancy, birth rate, infant mortality rate, death rate, GDP, coal production, the list goes on. The challenge in the game is aiming to achieve the victory conditions set out for you in each scenario. For example, one of them requires you to have a Human Development Index (HDI) of 0.7 for every region in the world yet you're not allowed to have oil production dropping below a certain threshold. 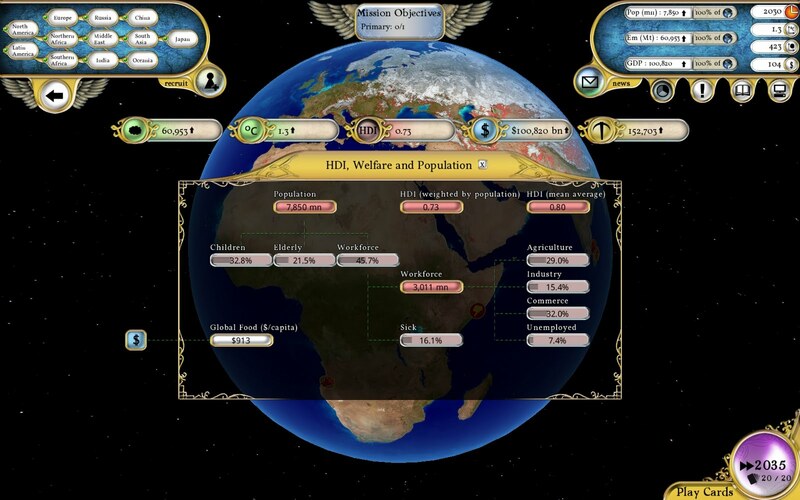 In one of the regions, India in this scenario, this is especially problematic as improving the HDI with medical welfare and education can only get you so far. Eventually all your hard work will go to waste if you can't keep supplying resources for the economy, however pollution is obviously not good for a healthy lifestyle, affecting your life expectancy which in turn affects your HDI. The game is interesting like this, yet also frustrating. You'll have six different cards to choose from as you play the game: environmental policy cards (e.g. providing better defences against storms), technology cards (e.g. research SmartGrids), energy policy cards (e.g. expand coal production), social policy cards (e.g. Medical Welfare programme), political policy cards (e.g. fund black ops) and long-term policy cards (e.g. build GEO HQ). To be truly successful you'll probably need a combination of all of them. Don't play enough environmental policy cards and people will think you're not doing your job making you lose support. Don't put enough investment into welfare and your HDI goes down. Don't invest in coal production and you can find your industry with resource shortages, and so on. Again, it is a challenge to make the right choice. 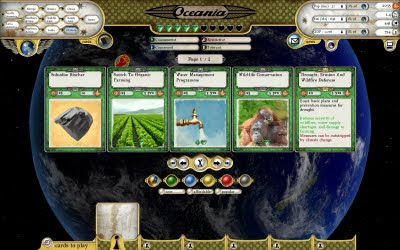 Even though there are some elements of randomisation (in terms of the events that can occur) and the fact you can choose from quite a few different actions in each game, in the end there are only seven scenarios in this game (yes, only seven) and they're bloody difficult too - so I guess in that regard you'll be replaying the game A LOT, IF you have the patience for it. The game, like any good Steam game, also has Steam achievements. It's refreshing to play a game that you know has been made for the PC and isn't a sloppy console port. There are an awful lot of clicks to get to certain information at times and the game doesn't really discuss the mechanics of each action that well in their in-game wiki - which means you'll sometimes wonder what kind of effect the cards you're using will have. A pretty fun edutainment title - if only it weren't so difficult! If you want to get the game, you can get it for cheap off Steam.